This month we ontinue the newest tradition here at Land Use Prof Blog of listing all new land use articles posted to SSRN within the last month. To wit, below are all of the new land use-related articles posted on SSRN in the month of March. As noted in previous months, this list was collected using the term "land use" in the SSRN search function. There will be articles on the periphery of land use law that are not caught by this search. There are lots of great articles from a number of familiar faces to check out. And notably for the blog, two editors--Matt Festa and Jessie Owley--make appearances on the list this month. 13 Do Land Use Policies Follow Road Construction? 15 Do Land Use Policies Follow Road Construction? Dove, Michael R. 1992. The Dialectical History of 'Jungle' in Pakistan. Journal of Anthropological Research 48(3) 231-253. Next City has announced its 2014 Vanguard class of urban leaders. It's an impressive group, though notably absent are any academics. See the full list here. The Idaho Law Review's symposium, Resilient Cities: Environment | Economy | Equity is fast approaching. It will be held this Friday, April 4, 2014, in Boise, Idaho and also live-broadcast for free on the Internet. The full schedule is here and also reproduced below. This year, we also decided to try something a little hi-tech for a bunch of law profs. I convinced Tony Arnold (Louisville) and Barbara Cosens (Idaho) to have a chat with me about resilient cities; however, I was in Boise, Barb was in Moscow, Idaho, and Tony was in Louisville, Kentucky. In addition, two radio hosts from Boise's Building a Greener Idaho also joined us. Together, we created an hour's discussion broadcast as a Google Hangout, captured on You Tube below, and which will be edited for a radio show to air here in Boise the next few weeks. I'm not going to say it all went according to plan--we had some glitches with audio and video at times--but overall, the experience proved to me that this format can be a valuable way to bring together law profs--and disseminate ideas from the academy--in a cost-effective and potentially powerful manner. I owe many thanks to Tony and Barb for agreeing to give this a try the first time around. I'm hoping that, should all go according to plan, there will be future hangouts integrating discussions of land use profs into this blog in the near future. San Francisco has some of the most restrictive formula retail land use controls in the country. It also is in the midst of considering amending those controls. Entering into the fray is a February, 2014 report from the city's Office of Economic Analysis. Read the full report here. • This economic impact report was prepared in response to a proposed ordinance (item #130788), introduced by Supervisor Mar in the Summer of 2013, which would expand formula retail controls in San Francisco. Formula retail controls limit the growth of chain stores within San Francisco. • The proposed legislation would both expand the definition of formula retail, and require the Planning Commission to consider an independent economic impact report detailing how a proposed chain store would affect existing businesses. • Formula retail controls primarily affect the economy by changing the retail prices paid by consumers, the amount of local spending by retail businesses, commercial rents and vacancy rates, and perceptions of neighborhood quality. • In general, chain stores charge lower prices, but may spend less within the local economy, and can be unpopular with some residents because they can be seen to diminish the character of the neighborhood. On the other hand, limiting chain stores can reduce commercial rents and raise vacancy rates. • Research by the Office of Economic Analysis suggests that local retailers may spend up to 9.5% more within the local economy than chain stores, but charge prices that average 17% more. On balance, the economic benefits of greater local spending by non-formula retailers are outweighed by higher consumer prices. • Accordingly, the report concludes that expanding the definition of formula retail in the city will not expand the local economy. Moreover, while the proposed independent report would document the impact of chain stores on existing businesses, a new store could benefit the economy without benefitting existing businesses, by offering lower prices to consumers, for example. • The OEA therefore recommends that the report instead consider the relative prices and local spending by proposed chain stores and existing businesses. In addition, the report recommends the Planning Commission explicitly consider the views of residents, and whether a proposed store could prevent blight. Well worth a read for anyone interested in formula retail land use controls. The uber-hip Brooklyn literary magazine n+1 just published a nice essay about the history of development of Boise as told through the personal story of a Boise native gone away to Brooklyn. The piece is, I think, a nice bookend to the 1974 article Tearing Down Boise, which appeared in Harper's 40 years ago. While the 1974 article foresaw the end of a city that almost tore itself down through flawed urban renewal processes, the 2014 n+1 article tells a story of a booming city that, ironically, is booming because of savvy urban renewal processes. It's a land use lover's dream! The two essays could be read as seminal pieces about how individuals relate to growth of a city and the effect of a city on an individual, much in the vein of Joan Didion's Goodbye to All That, which tells her story of leaving New York, or maybe more accurately, in the vein of Wallace Stegner's A Sense of Place, which speaks to the movement of westerners and how they frame identity. We need more stories of mid-sized cities, especially of those cities like Boise that are growing dramatically. As many have noted, the future of urban growth is not in megapolitan cities with 10 million or more people, but these 500,000 - 2 million person cities that are popping up all over and need their day in the sun. We [SSRN] are pleased to announce a new Legal Scholarship Network (LSN) Sponsored Subject Matter eJournal - State & Local Government eJournal, sponsored by Touro College Jacob D. Fuchsberg Law Center, and the Fordham Urban Law Center. Sponsors: Touro College Jacob D. Fuchsberg Law Center: Touro Law Center (http://www.tourolaw.edu) is an innovative law school located in Central Islip, NY that is dedicated to producing profession-ready graduates and to promoting social justice. It's rich state and local government offerings include: a disaster relief clinic and an institute on land use and sustainable development law that complement courses, externships and symposia. Touro Law faculty currently edit the Municipal Lawyer, a quarterly publication of the NYSBA Municipal Law Section. Fordham Urban Law Center: The Fordham Urban Law Center (http://law.fordham.edu/urbanlawcenter.htm) focuses on the many intersections between our legal system and contemporary urbanism. The Center conducts research into questions of urban law, convenes experts across a number of domains, and seeks to link scholarship to policy on the most pressing issues facing America's metropolitan areas. Description: This eJournal includes working and accepted paper abstracts that examine urban, state, and local government law and policy. States and local governments have primary responsibility for much of the basic infrastructure of the law - from property, torts, and contracts to the foundations of criminal law - and provide the public services that are of most immediate importance to everyday life. This eJournal encourages submissions from scholars engaged in researching every aspect of the work of state and local governments, including papers also published in related topic-specific eJournals. It is the goal of this eJournal to foster dialogue about state and local government law, both within the legal academy and across cognate disciplines. SSRN's searchable electronic library contains abstracts, full bibliographic data, and author contact information for more than 535,500 papers, more than 248,400 authors, and full text for more than 439,900 papers. The eLibrary can be accessed at http://papers.ssrn.com. Downloads from the SSRN eLibrary in the past 12 months total more than 10.4 million, with more than 73.8 million downloads since inception. Amicus brief sign-on request re affordable housing: Time-sensitive! I am writing to invite you to sign on to an amicus curiae brief by housing scholars in an important inclusionary zoning case currently before the California Supreme Court. A draft of the brief is attached. I am also attaching a one pager with a brief description of the case, a summary of the argument of our brief, and the names of people who helped draft it. If you wish to sign on, please email me (iglesias@usfca.edu) directly ASAP, but at the very latest by Tuesday, March 18th with the following information: Full Name, Title, your academic or other scholarly affiliation (for identification purposes only), and Address (street, city, state & zip code). Thank you very much for considering this request. I am happy to answer any questions you might have about the litigation or the brief. March 13-14: Rocky Mountain Land Use Institute Conference: Moving Beyond Recession: What Next? For those in the Mountain West like me, the place to be this week will be Denver for the Rocky Mountain Land Use Institute's annual conference, which this year is entitled Moving Beyond Recession: What Next?. See the program here. Planning in the Wild West brings out debates based on raw emotion and talk of freedoms and rights. Sometimes, factual information that could inform planning decisions is ignored because of factors that have nothing to do with planning. However, these factors must be addressed to make progress and get meaningful public engagement. Language, culture, perceptions, and trust can often be more important than the message when talking about things like property rights. This session will look at the lessons learned in Teton County and share some hard-earned pearls of wisdom for planners working throughout the emotionally-heated debates of the West. Stop by and see us if you are there. I am sad that my first post after a one-month hiatus is to report the passing of Environmental Law giant Joe Sax. His work on the public trust doctrine and the protection of natural resources (public and private) has had a significant impact on land use. And of course, he has has a significant impact on land use scholars. As a Berkeley Law alum, I had the opportunity to have Joe as a mentor -- a role he continued into my post-law graduate program and during my efforts to become a law professor. I'm sure well see some fuller tributes in coming days on Legal Planet and Environmental Law Profs. Get to know the neighborhood? There's an app for that. I've had a long fascination with the return of the neighborhood, and that is probably why I am especially fascinated by Nextdoor, an app that bills itself as sort of a "Facebook for neighbors." Here is how it works: you go to the app (or website), choose the neighborhood where you live, join that neighborhood's group, and when people post the post goes only to those within that neighborhood, not to all of your "friends" scattered around the world. I was skeptical at first, but I have to admit, I've come to really love it. In Boise, where I live, the police and fire departments now use Nextdoor to send out alerts on crime and hazards, but mostly the site is filled with questions you typically want to ask neighbors about: do you know a good roofer, who cleans gutters around here, someone beat up my kid at the park and did you see it, anyone have a good babysitter recommendation, and so on. Sometimes the posts border on the mundane, but it strikes me what a tremendous platform it is for community involvement and action. Within the small urban neighborhood where we live over 200 people are on the site; I couldn't imagine there are more than a thousand homes in the defined neighborhood area. A lot of people post often, but not too often, and everything has to do with something in the neighborhood. With just a few months of experience, I have come to believe apps like Nextdoor will be a part of the way that people start to use technology to build neighborhood comraderie. I should also add that the neighborhood where we live is also an extremely friendly area; my wife and I joke that some people are "aggressively friendly." The value of an app like Nextdoor is that it doesn't replace the traditional neighborhood structure but overlays on top of that traditional structure adding richness to it. 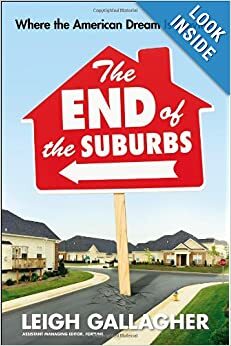 If you're looking for the book to give that person in your family who doesn't understand what land use law is, you might consider Leigh Gallagher's The End of the Suburbs: Where the American Dream is Moving. The book has been called "prophetic," though I'd note that it is, in many ways, a recounting of data any land use scholar has seen reproduced in numerous forms over the last several years (e.g., the Census). And so, most land use scholars won't find much new here, but it is packaged in an easy to read way that might make that nagging family member understand why land use is the most fascinating area of law ever, as we all know it to be. Those who teach or care about the case of Norwood v. Horney, a 2006 Supreme Court of Ohio post-Kelo case that restricted the state's use of economic development takings, will be interested to know that there appears to be an end to the story that provides an interesting book-end to Kelo. While the city won in Kelo at the U.S. Supreme Court, it lost the Pfizer plant it hoped to build in the poverty-stricken city. In Horney, the city lost in court but, in the end, it got to build a complex called Rookwood Exchange. To build, the developers paid the remaining holdout--er, property rights advocate self-styled as a Mrs. Kelo on the banks of the Ohio--$1.25 million for the boarded-up property below [updated: previous image link stopped working]. The project broke ground in 2011 and comes to full fruition this year. Click here to see more of the Rookwood Exchange as built out. H/t to my sister, who stayed at the Marriott on the site and tells me it's quite nice. How common are mandatory state registries of special districts? (iv) Except for cities and counties, the section of Idaho Code under which the entity was established, the date of establishment, the establishing entity and the statute or statutes under which the entity operates, if different from the statute or statutes under which the entity was established. (ii) An unaudited comparison of the budget to actual revenues and expenditures for the most recently completed fiscal year. (ii) The average length of term of all bond issuances or other debt obligations and the average interest rate of all bonds or other debt obligations. I wonder how common such state registries of special districts are? Are these ubiquitous, or would this be something new? Anyone out there know? In the aftermath of major storms such as Sandy and Katrina in the United States and the ravages of earthquakes, tornados, typhoons, tsunamis, and other natural disasters worldwide, the Section of State and Local Government Law (SLG) invites participation in a new program to address planning for resilience in anticipation of disasters, to include impacts on property rights, land use, development, public health, emergency management, and respective public and private sector roles and responsibilities. SLG will sponsor and lead this initiative. We anticipate that this will be an interdisciplinary program across the ABA and will also involve related organizations such as IMLA and APA. Our goal is to develop education and outreach through a series of programs, presentations, and publications. At the Section Council meeting in Santa Fe in October 2013, we developed an informal working group, including Ernie Abbott, Lai Sun Yee, Ed Thomas, Anita Miller, Rob Thomas, and Erica Levine Powers, and SLG Chair Andy Gowder (ex officio), to brainstorm these issues and report back to the Council at the 2014 Spring Meeting in Ashville, North Carolina. If you would like to join our effort, please contact Tamara Edmonds-Askew, Tamara.EdmondsAskew@americanbar.org, so she can set up a working group conference call early in 2014. Federal, state and local environmental laws have achieved significant improvements in public health over the past several decades. The development of these regulations also resulted in growing scrutiny about the costs and benefits of environmental rules. Traditionally the costs and benefits of a regulation are estimated prior to implementation of a law or regulation (what is known as “ex ante’ analysis), but there is also an increasing push to retrospectively analyze the impact of a regulation after implementation, through what is known as “ex post” analysis. The question is: how do the two forms of analysis compare? How accurate are the anticipated ex ante analyses when measured against the actual, measured costs of the ex post analysis? Dr. Richard Morgenstern will present and discuss his research on the evaluation of environmental regulations and compare the costs and benefits of federal environmental regulations estimated both before and after implementation. Dr. Morgenstern's work highlights pitfalls that can lead to inaccurate results and proposes a way to conduct retrospective analyses in the future--to ensure that the estimation of regulatory costs is as targeted and focused as the underlying environmental regulations. Richard D. Morgenstern, Ph.D., is a Senior Fellow at Resources for the Future (RFF). Dr. Richard Morgenstern's research focuses on the economic analysis of environmental issues with an emphasis on the costs, benefits, evaluation, and design of environmental policies, especially economic incentive measures. His analysis also focuses on climate change, including the design of cost-effective policies to reduce emissions in the United States and abroad. Immediately prior to joining RFF, Dr. Morgenstern was senior economic counselor to the undersecretary for global affairs at the U.S. Department of State, where he participated in negotiations for the Kyoto Protocol. Previously he served at the U.S. Environmental Protection Agency, where he acted as deputy administrator (1993); assistant administrator for policy, planning, and evaluation (1991-93); and director of the Office of Policy Analysis (1983-95). Formerly a tenured professor at the City University of New York. Dr. Morgenstern has taught at Oberlin College, the Wharton School of the University of Pennsylvania, Yeshiva University, and American University. He has served on expert committees of the National Academy of Sciences and as a consultant to various organizations. Dr. Morgenstern received his A.B. degree in economics at Oberlin College and his Ph.D. in economics at the University of Michigan. Dr. Morgenstern has published dozens of articles on environmental economics and policy and he has authored/edited of several books, including New Approaches on Energy and the Environment: Policy Advices for the President (with Paul R. Portney) and Reality Check: "The Nature and the Performance of Voluntary Environmental Programs in the United States, Europe, and Japan" (with William A. Pizer). West Virginia University College of Law’s Land Use and Sustainable Development Law Clinic is now accepting applications for the Land Use and Sustainable Development Law Fellowship. The fellowship combines the opportunity to work with attorneys, planners and students at one of the leading Land Use Clinics in the United States with the opportunity to obtain the WVU Law LL.M. degree in Energy and Sustainable Development Law. The LL.M. program provides a uniquely deep and balanced curriculum in perhaps the nation’s richest natural resource region. The Land Use and Sustainable Development Law Clinic (LUSD Law Clinic) provides legal services to local governments, landowners and non-profit organizations to develop land conservation strategies and practices. Legal services include, but are not limited to, title examinations, advising landowners and land trusts, drafting conservations easements, negotiating with mineral owners/lessees, working with communities to identify alternative wastewater solutions, drafting comprehensive plans and zoning ordinances, training local officials on land use issues, and facilitating public meetings. The WVU College of Law LL.M. in Energy and Sustainable Development Law is the only LL.M. program in the United States that provides a balanced curriculum in both energy law and the law of sustainable development. Working with WVUCollege of Law’s Center for Energy and Sustainable Development, LL.M. students will develop the expertise to advise clients and provide leadership on matters covering the full range of energy, environmental and sustainable development law. The LL.M. in Energy and Sustainable Development Law provides a broad and deep offering of courses, experiential learning opportunities, and practical training for every part of the energy sector. Our broad spectrum of courses allows our students to prepare to be lawyers serving energy companies, investors, environmental organizations, landowners, utilities, manufacturing companies, lawmakers, policymakers, regulators and land use professionals. This fellowship is a part-time (at least twenty hours per week), two-year position from August 2014 through July 2016. The Fellow will receive an annual stipend of $20,000 and tuition remission for the LL.M. program. The Fellow would take 6-7 credits per semester allowing time for part-time work at the Clinic. The position involves policy and legal research and writing; facilitating public meetings and workshops; supervising law students in the LUSD Law Clinic; and administrative responsibilities as needed. Many of our clients and partners work throughout the state and some travel is expected. The Fellow will support all aspects of the Clinic’s missions in the areas of land conservation, land use planning, alternative wastewater solutions and the education of law students in these areas. There is frequent overlap in the areas of energy and land use planning, including the reduction of vehicle miles travelled, energy siting, and energy efficient buildings. Efforts will be made to match project assignments with the Fellow’s interest. Candidates should possess a J.D. ; a strong academic record; excellent analytical and writing skills; a demonstrated interest and background in land use and sustainable development law and policy; and admission to the LL.M. program at West Virginia University (application for LL.M. admission can occur concurrently with the fellowship application). Preference will be given to candidates who have relevant experience in law, land use, or sustainable development. Admittance to the West Virginia Bar is preferred. Applicants should apply to Samatha.Stefanov@mail.wvu.edu. Please submit a letter discussing qualifications and interests, a resume, a law school transcript, a recent writing sample and contact information for three references. We are now accepting applications. The application deadline is June 1, 2014 or until the post is filled. Visit our website at landuse.law.wvu.edu for more information about our programs. West Virginia University College of Law is an equal opportunity employer and has a special interest in enriching its intellectual environment through further diversifying the range of perspectives represented by its faculty and teaching staff. Both houses of the Virginia General Assembly have passed legislation that would limit zoning of agritourism uses--even amplified concerts--in ag districts. Will McAuliffe sign it? More here. This appears just the latest salvo in the zoning of agritourism that is getting hotter all over the country. See, e.g., the Oregon Court of Appeals' December, 2013 ruling in Greenfield v. Multnomah County and the Tennessee Supreme Court's January, 2013 ruling in Shore v. Maple Land Farms.